As a heritage scientist I collect and use data on a daily basis; whether it’s documenting objects, collecting and analysing scientific data, or integrating data collected by others. However, like many other researchers, I have sometimes underestimated the value of my data to wider audiences. The Making Heritage Science Data FAIR and Impactful seminar was a good opportunity both for me to better understand my data, and an occasion to meet other heritage scientists and find out how they collect, use and manage data. Professor May Cassar, director of the UCL Institute for Sustainable Heritage and UK national coordinator of E-RIHS, kicked the day off by introducing the organisers and highlighted why this kind of seminar is so important for the heritage community. All three organisations engage individually with professionals around data and use, for example, one of the main streams of E-RIHS is digital data and FAIR principles is a core concept within the research infrastructure. ICON HSG aims to support access to heritage science data and improve dialogue between Heritage Scientists and related professionals to develop best practices, as we have recently seen with the ethical sampling guide and NHSF has recently published a national Strategic Framework for Heritage Science. As such, it was motivating to see the three organisers coming together to build a stronger, integrated heritage science community. The day began with a series of presentations, followed by an expert round table, and tours of the new technology applied by heritage researchers at UCL. From the presentations, participants gained greater understanding of differing types of heritage science data and how FAIR principles (findable, accessible, interoperable, reusable) can be applied to them. There were also animated discussions about ‘born digital’ data, ‘big data’ projects, and the economic power of data. The first session explored what heritage science data is and how different institutions collect, manage and store it. Three case studies were presented; Fishbourne Roman Palace (presented by Rob Symmons), ISIS Neutron and Muon Source – Science & Technology Facilities Council (presented by Antonella Scherillo), and Historic England (presented by Paul Bryan). Each presenter drew from their own experiences and it was beneficial to hear about the range of techniques currently being used for various types of data and different organisational infrastructures. Although FAIR principles are being used in heritage science, it was clear from the presentations that it is tied to an institution’s capabilities. The second session focused on dissemination and impact. Tim Evans from Archaeological Data Service (ADS) discussed how ADS make their resources available through their online catalogue, as well as wider issues around data access and how we can improve this – something that E-RIHS is hoping to achieve through their DIGILAB platform. Sara Gould (British Library) and Luigi Galimeberti (Tate) continued the session, discussing their project to create a shared research repository showcasing the multidisciplinary research conducted by organisations; to monitor and evaluate the impact of the research across organisations; and play a fundamental role in centralising, preserving and making research accessible. Currently the project is in its pilot phase but it could offer an exciting opportunity for professionals to instigate FAIR principles across UK organisations. Maja Maricevic (British Library) brought the presentations to a close with a thought-provoking presentation about heritage data’s economic impact and the opportunities and challenges heritage organisations face when dealing with large amounts of data. The seminar concluded with a round table discussion. Experts debated larger questions, such as changing technologies; the political landscape, and how this will affect FAIR principles; data ethics; how to best share data between institutions; and policy creation. They also discussed with the audience issues around resources and funding, data transfer, storage and how to disseminate data online. While not all the questions could be fully addressed by the panel, it was a great opportunity to start wider conversations about impact and FAIR heritage data. We are looking for a Communications and Administrative Assistant. The role holder will work on the EU H2020 European Heritage Science Research Infrastructure Preparatory Phase and be responsible for the project’s communications, including its website, social media, drafting printed materials and organising and running events. The full description for the role and links to applying online can be viewed here. The Imaging and Sensing for Archaeology, Art history and Conservation (ISAAC) Lab at our partner Nottingham Trent University, is holding a free, two-day interdisciplinary workshop on March 28-29, 2019. This workshop aims to bring together those engaged in the study of heritage from different backgrounds (historians, curators, archaeologists, conservators and heritage scientists) to illustrate how science can address a wide range of research questions related to heritage objects and to foster interdisciplinary collaboration between the participants. See here for more information and to reserve your place. How can E-RIHS support research on heritage interpretation, conservation, documentation and management? Learn about the cutting-edge tools and services that will be provided by cross-disciplinary groups of researchers to cross-disciplinary users and scientific communities working to advance knowledge about heritage and to devise innovative strategies for its conservation. Register now for an upcoming dissemination day on E-RIHS hosted by The Imaging and Sensing for Archaeology, Art history and Conservation (ISAAC) Lab and our partner Nottingham Trent University on March 27, 2019. See here for more information and to reserve your place. We are happy to announce that registration is now open for the Making Heritage Science Data FAIR and Impactful seminar taking place on February 11th 2019. The seminar is jointly organised by E-RIHS, the National Heritage Science Forum (NHSF), and ICON-Heritage Science Group will take place at the UCL Here East Stratford Campus, London E20 3BS. Pleas register here. The seminar is free to attend. On October 18th 2018 experts from over sixteen countries were brought together for an international workshop “From Cross-disciplinary Research to Heritage Science” in Florence, Italy organised by E-RIHS and IPERION CH. The meeting aimed to celebrate and reflect on the twenty-year multidisciplinary collaboration between the National Research Council of Italy (CNR) and the Opificio delle Pietre Dure (OPD), as well as address the future vision and challenges of heritage science research and collaboration within Europe. The workshop included speakers from OPD, CNR, the Peggy Guggenheim Collection, the French National Centre for Scientific Research (CNRS), the Spanish National Research Council (CSIC), International Centre for the Study of the Preservation and Restoration of Cultural Property (ICCROM), and University College London (UCL). Interdisciplinarity is key. Past and present projects show that humanities and sciences are compatible disciplines that need to be used together to best preserve our heritage. Researchers are continually working together to improve technologies to investigate heritage objects. Heritage scientists and conservators are a critical conscience to the global challenge of the heritage preservation. We as experts need to determine the demand for conservation as we are best equipped to recognise the symptoms of deterioration. E-RIHS can increase the impact of heritage science by fostering collaborative and cross-disciplinary skills, providing a common forum for STEM and humanities users and researchers, and enable a shared identity through a strong heritage science network. All of which will have impact beyond the heritage science community. The presenters also discussed key global challenges that will need to be addressed by E-RIHS; including global inequality and vulnerability between countries, the need to increase the impact of heritage science, and a lack of a clear ‘heritage scientist’ identity; leaving the participants with provocative ideas to be considered. Overall, it was a fantastic day of knowledge sharing where participants were able to extensively discuss the past, current and future state of European heritage science. The full roundtable discussion is available here and the speakers presentations will soon be available on http://www.e-rihs.eu/. To celebrate parliament Week 2018 and the year of VOTE100, UCL Public Policy have produced a series of podcasts featuring UCL experts and the women who have inspired them in their journeys. 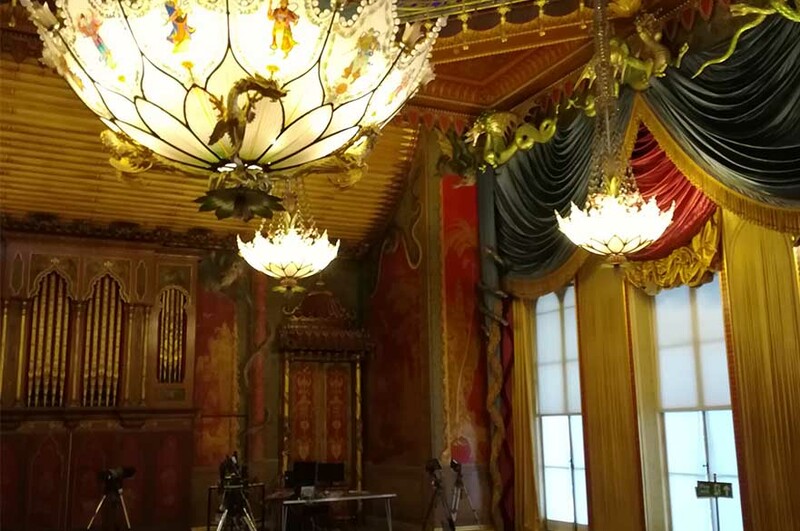 E-RIHS UK National Coordinator, Professor May Cassar has been invited to speak about Heritage Science and policy on the UCL Parliament and Me podcast, a series celebrating UCLs engagement with the world of policy. May was also joined by Baroness Margaret Sharp, who inspired her to engage with Parliament and who she considers “a much-needed champion of heritage science.” Together they share stories from their eighteen years working together, including the pivotal 2006 Parliamentary Inquiry into Science and Heritage by the House of Lords Science and Technology Committee, their shared ideals of public engagement, memory and community impact, and the creation of the Mobile Heritage Lab, a portable laboratory to reach fixed, large and fragile heritage objects. Listen May’s episode here. You can also follow the whole Parliament and Me series here. The European Research Infrastructure for Heritage Science will have more and easier access to a game-changing global expertise, thanks to a newly announced partnership. On 6. September at the Interim E-RIHS PP meeting in Warsaw, Luca Pezzatti, the E-RIHS PP coordinator, signed the letter of cooperation with Webber Ndoro, Director – General of International Centre for the Study of the Preservation and Restoration of Cultural Property (ICCROM). In the presence of Alison Heritage, ICCROM’s Heritage Science Officer, E-RIHS has sealed the first partnership with a renowned global heritage organisation. The event took place in the state-of-the-art Biological and Chemical Research Centre at Warsaw University (CNBCh UW), a research facility located on the “Ochota” Campus. The CNBCh UW is dedicated to scientists conducting advanced research in the development of new technologies in the fields of cultural heritage, environmental conservation and new materials. Established in 1956, ICCROM works to promote the conservation of all forms of cultural heritage across the world. With a membership of 136 Member States, it supports those working on the front lines of heritage preservation, including scientists, conservators, museum curators, site managers, archivists, researchers and archaeologists through world-class initiatives in conservation training, information, research, cooperation and advocacy. For more information about ICCROM, see here. global importance for cultural heritage conservation.” For full text of the Statement of Cooperation between ICCROM & E-RIHS see here. training opportunities to enable transdisciplinary working within heritage science”. The E-RIHS Training Academy, led by UCL, one of the UK hub members, will hugely benefit from the partnership in designing and delivering state of the art training to heritage scientists, research infrastructure managers and users. The signing of the letter of cooperation demonstrates E-RIHS’s international commitment to strengthening strategic relationships, building global connections and collective capabilities, and establishing the international cooperation to come together to achieve common goals in the protection, conservation and management of cultural heritage. For more information about E-RIHS’s global vision, see here. The European Research Infrastructure for Heritage Science, E-RIHS [ˈīris], is working to launch DIGILAB: the new data and service infrastructure for the heritage science research community. The DIGILAB platform will provide remote services to the heritage science research community but will also be relevant to and accessible by professionals, practitioners and heritage managers. DIGILAB will enable access to research information as well as to general documentation of analyses, conservation, restoration and any other kind of relevant information about heritage research and background references, such as controlled vocabularies, authority lists and virtual reference collections. For more details about DIGILAB see here. By safeguarding information and enabling access to it, archives provide an indispensable component of the digital ecosystem of cultural heritage. As current archival approaches are quite fragmented, there is a critical need for an overarching methodology addressing business and operational issues, and technical solutions for ingest, preservation and re-use. One of our partners, the University of Brighton’s Cultural Informatics Research and Enterprise Group, has developed an extensive expertise in the area of digital preservation. In particular, the team has an established reputation for work in the curation and preservation of complex objects such as 3D renditions of cultural artefacts, as well as in data warehousing, database archiving, and data mining. With this background in coordination and dissemination, the team took a leading role in E-ARK, working on piloting a pan-European methodology for electronic document archiving. Between 2014 – 2017, the Group coordinated a consortium of 17 partners from the UK, Slovenia, Denmark, Germany, Spain, Estonia and others. As part of the E-ARK (European Archival Records and Knowledge Preservation) consortium, the group worked to synthesise existing national and international best practices to keep records and databases authentic and usable over time. The project results fed into building an archival infrastructure across the EU and in environments where different legal systems and records management traditions apply. E-ARK has also demonstrated the potential benefits for public administrations, public agencies, public services, citizens and business by providing simple, efficient access to the workflows for the three main activities of an archive – acquiring, preserving and enabling re-use of information. The E-ARK open source, digital archiving framework, complete with accompanying metadata and other standards, has been thoroughly tested and has made a significant impact on the institutions who carried out the pilots: this has been assessed by carrying out semi-structured interviews at the pilot sites based on a detailed impact questionnaire. The results improved public awareness and allow web-based access to tools. The project worked to make archival processes open to re-evaluation, and to enhance the preservation and visualisation of archives. The expertise of University of Brighton’s Cultural Informatics Research and Enterprise Group as well as other UK partners, from the Archaeology Data Service to the National Gallery, will contribute to the construction of the DIGILAB and its services for new communities of users. The Group’s research focuses on technical areas, including 3D digitisation technologies, virtual environments, archives and collections management systems, web and museum based interactive applications and language technologies; and non-technical areas, including testing, economic and social impact evaluation in support of the development of the cultural heritage sector and its opportunities in tourism, entertainment and education. As an expert in international project management, the group is a leader of the E-RIHS Risk Management Framework to design, implement, monitor and improve risk management consistently and efficiently across all aspects of the research infrastructure’s activities. It will enable a Corporate Risk Management function to be embedded in the structure and support audit activities.